I love cheesecake, and when I found out that I can successfully make it at home, I will never go back to the store-bought version. Not that anything is wrong with the store-bought one, it’s just I prefer to control the quality of the ingredients. These mini cheesecakes are great for entertaining because they are small and individual portions, you don’t feel like you’re eating a huge piece of cheesecake that will make you feel guilty afterwards. I use of course all organic ingredients for 99% of my recipes, and I’d recommend for those who can afford it, to do the same, after all, you are what you eat! Place a paper cupcake liner in each cup of muffin pan. Beat cream cheese with a handheld electric mixer until fluffy. Add sugar and vanilla, beating well. Add eggs, 1at a time, beating well after each addition. Lay a vanilla wafer, flat side down, in each muffin cup. Spoon cream cheese mixture over wafers. Bake for 20 minutes. Allow tarts to cool completely. 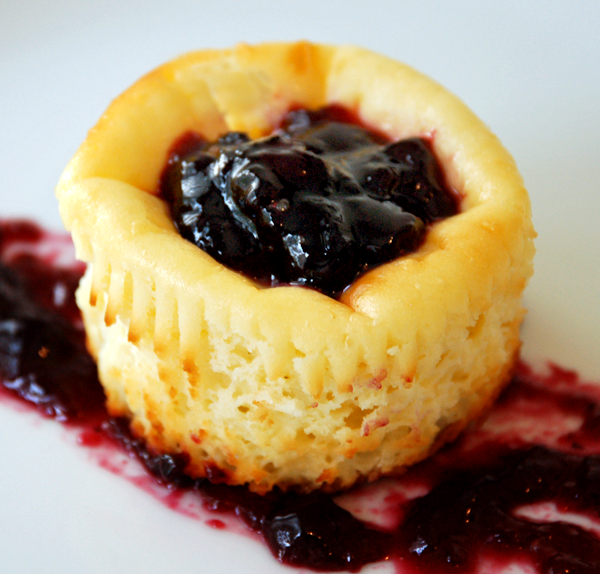 Top with blueberry jam or any filling of your choice.